Einstein married Elsa Löwenthal (née Einstein) on 2 June 1919, after having had a relationship with her since 1912. She was his first cousin maternally and his second cousin paternally. In 1933, they emigrated permanently to the United States. In 1935, Elsa Einstein was diagnosed with heart and kidney problems and died in December, 1936. Second wife of scientist Albert Einstein. Born on January 18, 1876, in Ulm, Germany. 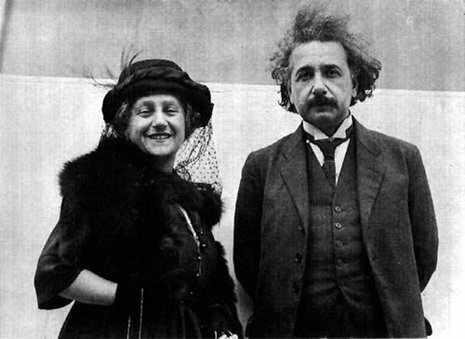 From the 1910s until her death, Elsa Einstein was an invaluable aide and trusted companion to her famous physicist husband Albert. She and Einstein were distant cousins and had known each other growing up. The pair became especially close around 1912. Even though he was married at the time, Albert had a romantic correspondence with Elsa during this time. Einstein moved to Berlin where she lived in 1914. Before becoming involved with Einstein, she had been married and divorced. She had two daughters, Ilse and Margot, from this relationship. Einstein eventually became like a father to her children. When Albert Einstein became seriously ill in 1917, Elsa nursed him back to health. Throughout their time together, she would become known for her devotion to him. Two years later, after his divorce was finalized, the couple wed on June 2, 1919. Albert's passion for Mileva ran deep, but that didn't stop him from meeting other women when they were apart. Still climbing the academic ladder, Einstein frequently traveled for work, and he met his cousin Elsa Löwenthal while on a brief trip to Berlin in 1912. By the time Albert and Mileva divorced in 1919, he had been living with Elsa for nearly five years; she soon became his second wife. But Einstein's flirtatious, often secretive letters written over the course of the next 36 years attest to his many affairs throughout the rest of his life. With the success of his 1905 papers, Einstein had become a prominent scientist. In 1913 he was inducted into the Prussian Academy of Sciences, and he became a theoretical physicist at the University of Berlin a year later. There, with no teaching obligations, he immersed himself in physics. Mileva wrote to a friend complaining that science came first, the family second. Tension grew as Einstein continued to pursue clandestine relations with his cousin Elsa, who lived in Berlin. After a decade of marriage, Albert had fallen out of love with Mileva. Four months after he signed his divorce settlement in Zurich, Einstein married Elsa Löwenthal in Berlin. Before Mileva agreed to a divorce, Albert sent her this list of "conditions," under which he was willing to remain married to her. Among his terms are, "You make sure . . . that I receive my three meals regularly in my room," and "You are neither to expect intimacy nor to reproach me in any way." When Albert fell ill in 1917, his cousin Elsa Löwenthal nursed him back to health. He found her devotion endearing. Even before the couple married in 1919, Albert embraced Elsa's two daughters, Ilse and Margot, as his own children. Described as Einstein's "plump, wide-faced, watchful Frau," Elsa faithfully remained at his side as a travel companion and hostess. She died in Princeton in 1936.